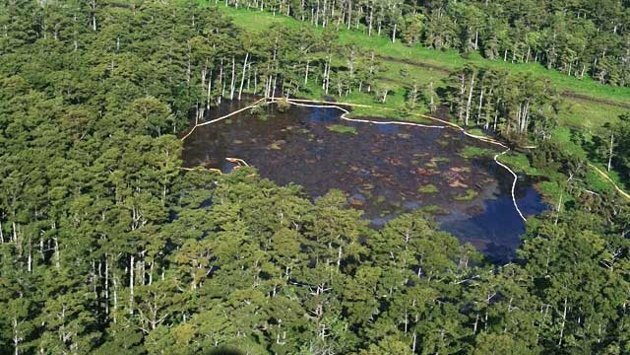 A nearly 400-foot deep sinkhole in Louisiana has swallowed all of the trees in its area and enacted a mandatory evacuation order for about 150 residences for fear of potential radiation and explosions. The 400-square-foot gaping hole is in Assumption Parish, La., about 50 miles south of Baton Rouge. The sinkhole sits in the middle of a heavily wooded space where it has consumed all of the soaring cypress trees that had been there. Flyover photos show some of the treetops still visible through the mud. Authorities enacted a mandatory evacuation for between 100 and150 homes in the area, but most people have chosen to stay, according to the Mayor's Office of Emergency Preparedness. If any of the dangers seem to become more imminent, the order will be escalated to a forced evacuation. While officials are not certain what caused the massive sinkhole, they believe it may be have ben caused by a nearby salt cavern owned by the Texas Brine Company. On Thursday, Louisiana's Department of Natural Resources required that Texas Brine drill a well to investigate the salt cavern as soon as possible, obtain samples from the cavern and provide daily reports on their findings. It could take up to 10 days to set up the drilling process, even with an expedited process. "We have to arrange for the driller. We have to pick a location. We have to be very careful to not be in a point that's too close to the sinkhole because of the weight of the rig," Texas Brine Company spokesman Sonny Cranch told ABCNews.com today. "We don't want to aggravate the situation." The sinkhole is on the outside edge of the salt dome where this particular brine well is located. "There are some indications that it very well may have been connected, but there's just indications," Cranch said. "There's nothing concrete that has connected the sinkhole to the cavern." There was bubbling in the water and the sinkhole is near areas where there has been exploration for oil and gas in the past, which would make the presence of low levels of naturally occurring radioactive material (NORM) possible. The state's Department of Environmental Quality said water samples from the sinkhole showed oil and diesel on its surface, but initial readings did not detect radiation. In the days after the sinkhole opened up on Aug. 3, nearby Highway 70 was closed down because officials discovered that the sinkhole caused a 36-inch natural gas pipeline to bend and feared the possibility of an explosion, according to ABC News' Baton Rouge affiliate WBRZ. "That's why the mandatory evacuation is going to stay on, because there is a risk for explosion," John Boudreaux of from Assumption Parish Emergency Preparedness said at a meeting with residents on Tuesday, WBRZ reported. "We are determined to do everything we can to find the answer," president of Texas Brine Mark Cartwright told the residents. Some community members were visibly frustrated with the situation and lack of answers. "You can give us a straight answer because that's all we want," one woman said at the meeting. "We want to know when we can come home and be safe. Because you all go home after a days work. You're safe, but we're not." Gov. Bobby Jindal issued a declaration of emergency allowing the Governor's Office of Homeland Security to assist in the efforts if necessary. "This is extremely serious and it's been going on for too long to still be at this point," Kim Torres, spokeswoman for the Office of Emergency Preparedness, told ABCNews.com today. "The people are very aware of how serious this is."